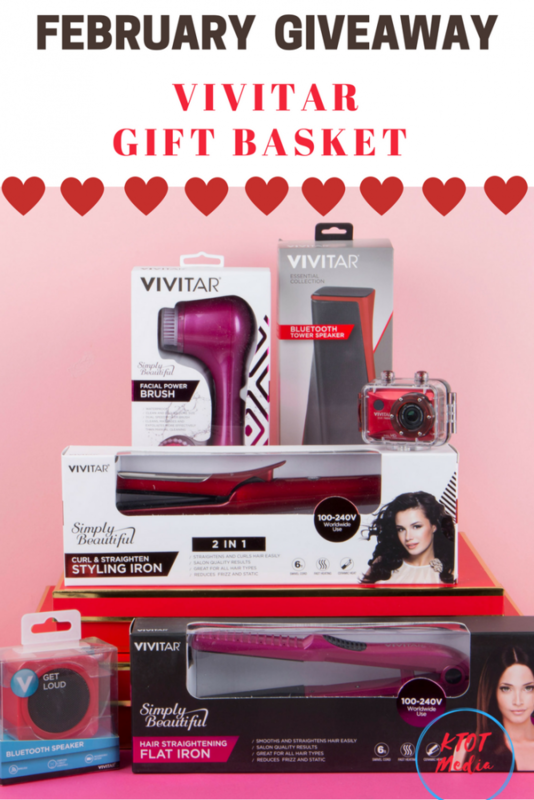 We have teamed up with Vivitar to give away an amazing Valentine’s Day Gift Basket. The giveaway will run for the entire month of February. Please enter as much as you want (remember you can TWEET every day) and SHARE with your family and friends. February is the month of LOVE, and we cherish our readers a lot! I adore me some VIVITAR from camera, lenses, beauty items and of course SPEAKERS. Vivitar has been around since 1938, and so we know this is a brand to trust. Living in a house of TEENS these items are going to come in handy, I bet. My daughter loves to do her hair so the newest flat iron or styling iron will be a wonderful addition to her beauty routine. My son well he is a skateboarder so that HD Camera and Speaker will come in handy for his days at the park. He likes to post his flips and jumps online, so the camera is going to be a hit. Please enter below and GOOD LUCK! Make sure to check out more about Vivitar HERE, plus you can buy Vivitar items on Amazon, Target, Walmart and other local stores. One WINNER will win a gift basket with Vivitar products. Sponsor is responsible for sending out the prize (not KTOT) please allow 4-6 weeks. US ONLY! Good luck! I believe the Styling Iron is my favorite item in the basket. I am needing one so badly. I would love a blue tooth speaker. I love the curling iron! My favorite is the speaker(s). I like the Bluetooth speaker. I like the 2 in 1 styling iron! I would love the Facial Power Brush! My wife would love a new curling iron or flat iron. My favorite item is the flat iron. I like them all but my favorite is the flat iron . I’d really love that Facial Power brush! A basket of great Vivitar stuff! I have been wanting to try a facial power brush and love to try new hair styling aids. The red curl and straightening iron is my favorite. I need the curling iron!! This is all so nice! I especially love the camera. The flat iron! My hair could use it! Flat iron is my fave! I would love it all especially that HD camera! The HD Camera would be my favorite, I think. It would be the flat iron. The styling item is something I really want. My favorite item would have to be the Styling Iron! the flat iron I have frizzy curly hair!!! My favorite item in the gift basket is the HD Camera! This would be perfect for some Valentine’s Day photos! I would love to try out that flat iron! The curl and straightner looks amazing! The styling iron is my favorite. I am most excited about the facial brush but I live that there is something for everyone in the giveaway. The camera is my favorite, but these are all great things to have! This single working Mama would love to win the FLAT IRON for my thick,unruly hair!! Loving their camera but those styling items look awesome. The flat iron is my favorite item. Te 2 in one styling iron would be my favorite since I love to change from curls to straight daily! If I had to pick a favorite it would be the camera. The Bluetooth Speaker is my favorite item. My favorite would be the Curl & Straighten Styling Iron. The flat iron is one of my favorite items. The camera would get a lot of use at our house. The Facial Power Brush is my favorite! I could really use the flat iron. I love the flat iron! My favorite is the flat iron. Definitely can use one of those at this time of year. The flat iron is my favorite. But the camera is running a close second! What an awesome basket. I like the flat iron. My son would love the speaker and camera. The HD camera, my camera on my phone and tablet are atrocious ? The power facial brush is what I’m most excited for! I think it’d really hello the texture of my skin, I just keep putting off getting one. I like the flat iron! My favorite item is the camera. The flat iron is my most favorite item. The Hair Straightening Flat Iron is my fave !!!!!!!!!!!!!!!!!!! I like the camera as the family photographer. Hubs would def take the speaker and my daughter will confiscate the flat iron right away. This is an awesome basket of goodies. I’d love the Vivitar camera!! We’re heading to Europe and would love to bring this along to capture all our vacation memories! This is such an amazing basket, thanks for the chance! I love that 2 in 1 styling iron. I’m loving the styling iron! I really like the curl and straighten styling iron. Wow – this would be so helpful for me!! Love everything in the basket. My favorite thing is the camera though. Great giveaway, thanks for the chance to win! How can I choose? 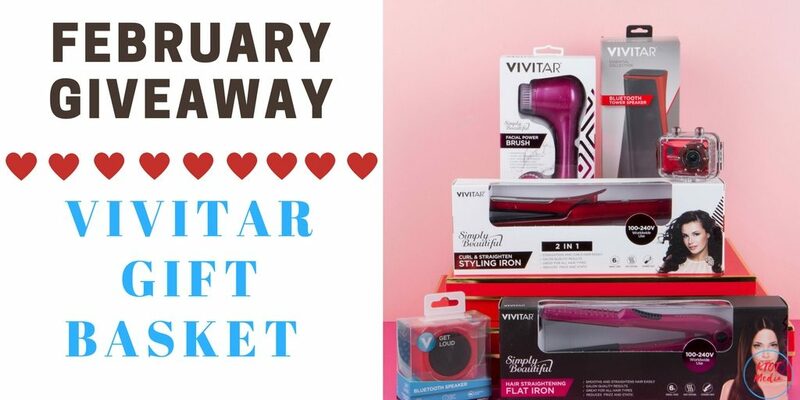 Ok I really like that Vivitar 2 in 1 Styling Iron! Wow, so many awesome products! I would be most excited to try the facial power brush for sure! They are all so fantastic but I am super excited about the Styling Iron. I like 2 in 1 styling iron. The curling/styling iron is something I definitely need, so I’m going to say that’s my favorite item. Vivitar makes awesome products, I’ve got my eye on that Bluetooth speaker as well. The facial power brush is my favorite item. The HD camera is my favorite thing… but all of them seem so useful!! I love the styling Iron and the Flat Iron and my hubby would love the bluetooth speaker! LOve the camera! and also the flatiron. The flat iron is my favorite item! That would be so handy. The facial brush is my favorite. It would be great to have. Thee flat iron is the one I love the most in the basket! The Flat Iron is my favorite in the Basket. I really do need a new camera, also. I really like the camera. The Flat Iron is my favorite!! I could use that!! I love the gopro camera. It 8s a tough choice between the flat iron or camera. I could use the flat iron more so I go with that. So many great Vivitar items in the basket! I think I would like the Vivitar camera the most. We are a family that enjoys capturing the memories. My favorite is the styling iron. My favorite item in the gift basket is the HD camera. I’d love the Curl/Straightening iron. The Bluetooth speaker is my choice. 2 n 1 Styling iron. The facial power brush for sure. I think the facial brush is my favorite in the basket! the styling iron looks great! Facial Power Brush looks amazing to use love to try one. My favorite thing is the camera. The styling iron is my favorite! Looks like the best basket ever!